Saffie Barrie Akam is a Sierra Leonean Pharmacist and owner of Everhealthy Pharmacy where she focuses on delivering an excellent and affordable pharmaceutical care for her community. Saffie worked for one (1) year as an intern at Connaught hospital, City Pharmacy and the Central Medical Stores under a program coordinated by the Pharmacy Board of Sierra Leone. Later, after she then proceeded to start her community Pharmacy practice. 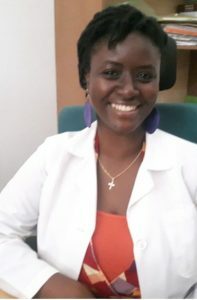 Saffie attended the College of Medicine and Allied Health Sciences and graduated with a Bachelor’s degree in Pharmacy and is also a member of the Pharmaceutical society of Sierra Leone. She is also a preceptor for the internship program for new Pharmacy graduates in the community practice setting.